I first heard about Auvergne, a region in south central France, from my friend Françoise, who is from there. She always talked about how beautiful the landscape is. She never mentioned the volcanoes, so I was surprised to learn that Auvergne has the most volcanic areas of France and of all Europe. Dormant volcanoes form chains of wooded mountains for some beautifully rugged scenery, one of the area’s best features. Where is it? Auvergne lies just below the center point of the country, in a mountain range known as the Massif Central. This region is made up of four departments, similar to counties. Along with hiking trails on the volcanic mountains, the green hills and open spaces, lakes, and forests make it a prized hiking destination. There are two regional parks, the Livradois-Forez Park and the Natural Regional Park of the Volcanoes of the Auvergne. The Forest of Tronçais is the largest oak forest in Europe, covering over 25,000 acres. If hiking is not your interest, or if you’d like to add other activities to your visit, you’ll find at least 10 spa towns where you can relax and rejuvenate. One of these is Mont Dore, near the Dordogne River. Y’ou’ll be able to hike for a while and then visit the spa… or the other way around! Although Auvergne has a lower population overall than other parts of France, it is still home to many important industries, such as Michelin Tire Company, in Clermont-Ferrand (the region’s capital) and Volvic mineral water. It is also an important center for research in biotechnology, pharmaceutics, metals, and food science. In case you thought the Loire Valley had all the chateaux in France, think again. In Auvergne there are over 50 chateaux and some 500 Romanesque churches, some dating before 1000 AD, along the Route des Chateaux d’Auvergne. Many picturesque villages are scattered among the towns, monuments, and hillsides. Getting there: You can take a train between Paris and Clermont-Ferrand (about 3 hours) or from Toulouse in the southwest. 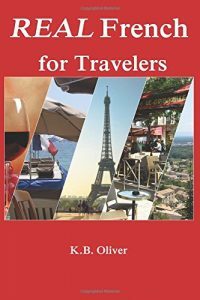 If you take a train from Clermont-Ferrand or Toulouse to the smaller town of Aurillac (in the southwest of Auvergne), you’ll be able to pass by many picturesque towns and villages. Speaking of Aurillac, you’ll enjoy this medieval-looking town with its half-timbered houses as well as those of gray volcanic stone. After you’ve browsed the shops and winding roads, you can visit two 15th century churches, Saint-Géraud with its frescoes, and Notre-Dame-aux-Neiges, which used to be part of the Convent of the Cordeliers. The Chateau Saint-Etienne dates from the 9th century and has the Museum of the Volcanoes (bet you have never seen one of those!) Market days are Wednesdays and Saturdays. Tournemire and Salers, north of Aurillac. Vieillevie: A small but lovely medieval village with a 11th century chateau, adapted for centuries after. Be sure to taste the cheese made in this town. Mourjou: This town’s most important industry is growing chestnuts! There is even a chestnut museum and desserts based on chestnuts, as well as an annual chestnut festival in late October. Marcoles: Started in the 10th century, this medieval village is full of cobbled streets, flowers, and a fortified wall. Closer to the central part of Auvergne you’ll have a new list of places to see. The largest city, Clermont-Ferrand, where you’ll find the Black Cathedral (built from black lava stone), is here in central Auvergne, and nearby are most of the volcanoes and nature areas. The Regional National Park of Auvergne Volcanoes contain natural sites, the Monts-Dome, the Monts-Dore, and the Cantal Mountains. 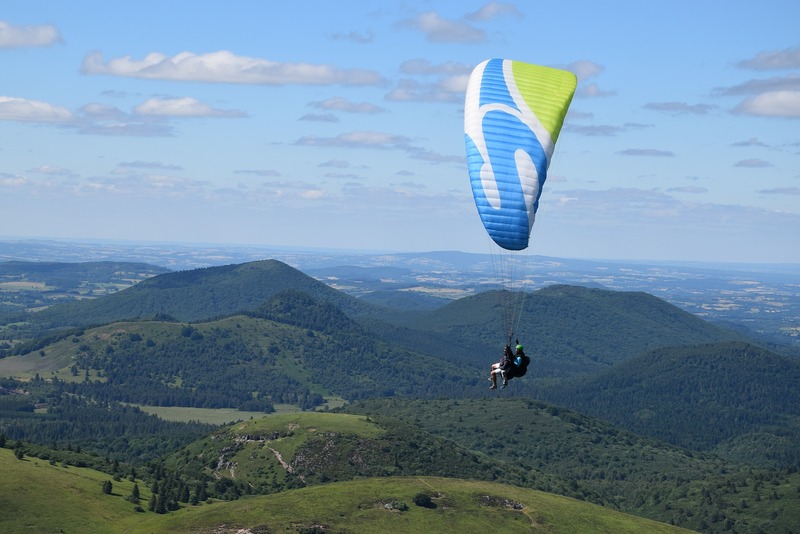 Nearby is the Puy-de-Dome, an extinct volcano that is the highest in the region and offers spectacular views. Chaine des Puys is a row of extinct volcanoes near Puy-de-Dome. 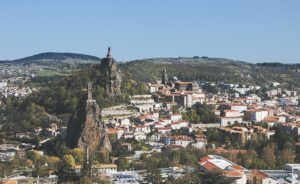 You can access the Puy by walking 90 minutes uphill or by taking the train that takes you up from the visitors’ center. Livradois-Forez is a regional natural park. Issoire: South of Clermont-Ferrand, it is known for its Mediterranean architecture, sometimes called the Tuscan Auvergne. Riom: a larger town, also south of Clermont, full of Renaissance buildings; it was the original capital of Auvergne in the Middle Ages. Volvic, a spa town whose mineral water is bottled and distributed around the world. You can visit the source and take a guided tour. Thiers: East of Clermont, it is known for making cutlery. Maker of the Sabatier knife. The medieval center is interesting, even if parts of the town are neglected. Many dishes are made with pork, or Charolais beef, a special beef from the region, paired with garden vegetables. Green lentils from Le Puy have been grown in volcanic soil, so have a distinct flavor. You can buy these in grocery stores across the country. While you are at it, don’t forget the blackberry caramels, chocolate-covered almonds, and stuffed cabbage. 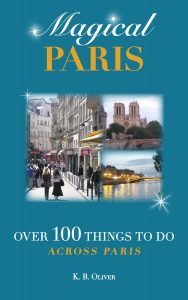 This should give you plenty to see, do, (and eat), whether you want to hike a volcano or visit France’s most beautiful villages, or perhaps both!